Meet Your Windmiller Equine Veterinarian! Lauren McPherson, DVM, was born in Wexford, PA, just north of Pittsburgh. She moved to Schilde, Belgium when she was 8 where she first fell in love with horses and began taking riding lessons from a bi-lingual instructor. After returning to the US, Lauren rode, trained and competed in the Cleveland, Ohio area hunter/jumper circuit with her two thoroughbreds, Sparks and Honor. She graduated from Solon High School in 2007. ​Lauren earned her B.S. in Veterinary and Biomedical Science from Penn State University in 2010, graduating with Honors. At Penn State, she worked at the Animal Diagnostics Lab and wrote an undergraduate thesis evaluating West Nile Virus vaccines and the immune response in foals. Prior to admission to vet school, Lauren worked as a veterinary assistant for her equine veterinarian. In 2015, she graduated from The Ohio State University College of Veterinary Medicine. ​Following graduation, Dr. McPherson interned at Southwest Equine Hospital in Scottsdale, Arizona. 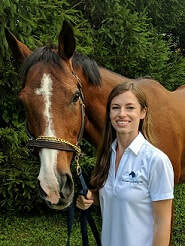 She then returned to Ohio as an Associate Veterinarian at Crum Equine Veterinary Service located in Lancaster, Ohio before starting her own practice. Dr. McPherson's primary interests are lameness and diagnostic imaging, preventative medicine, and ophthalmology (eye disease and medicine). Dr. McPherson is a member of the American Association of Equine Practitioners (AAEP) and the American Veterinary Medical Association (AVMA). ​In her spare time, Dr. McPherson loves watching movies and Cleveland Indians baseball, riding her horses, and spending time with family and friends.